Make sure to click on the images to see larger versions of them. OCEAN BEACH, CA. 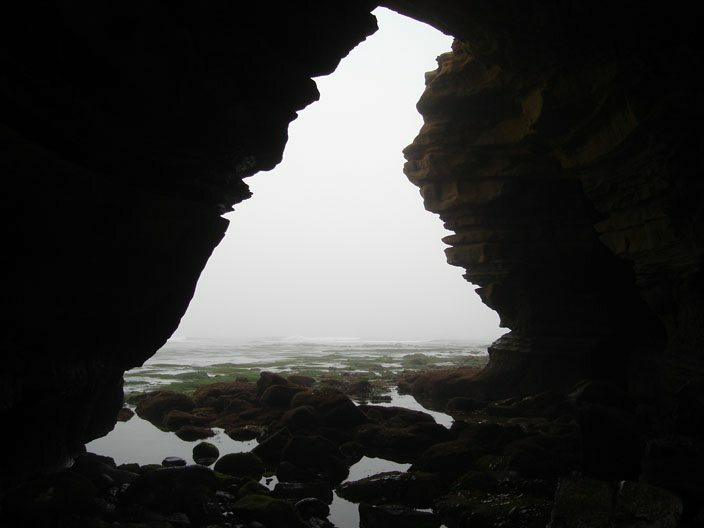 There are secret caves along the cliffs in Ocean Beach. It just so happens that the stretch of cliffs next to the boulevard of the same name, from Point Loma Boulevard south to Ladera Street, contain an array of beautiful, hidden and fairly inaccessible caves. Only during real low tides are some of them reachable. 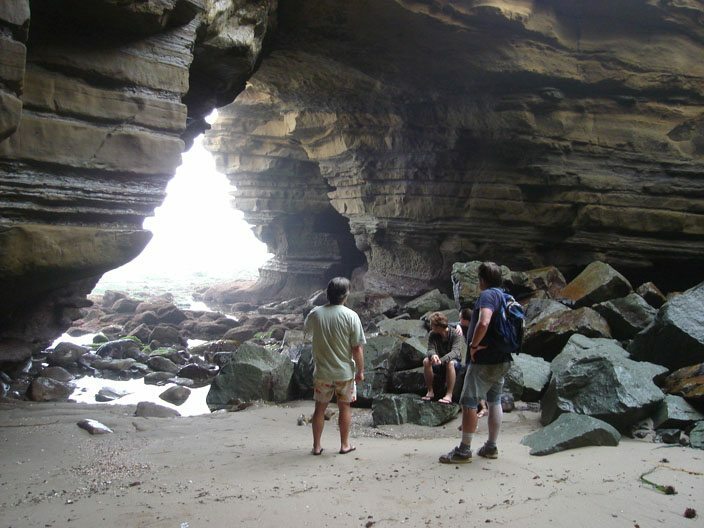 But these hidden geological grottoes and cuts in the sandstone cliffs and the beaches and pools inside them are nature’s displays of the wondrous interplay of land and sea that has occurred over time – right here on our front porch. 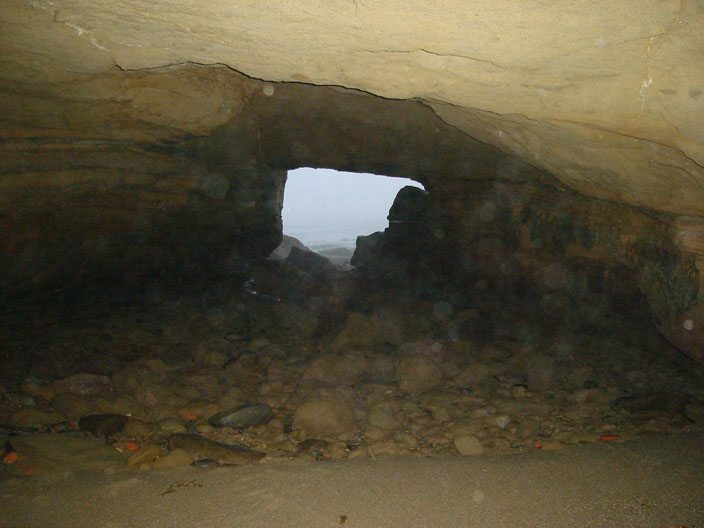 For many of the populace who reside above them, these are truly secret caves, as one can live in OB or Point Loma for decades without knowing or visiting these caves of mystery. On July 4th, Patty and I joined a handful of others in meeting Larry O’Brien and his wife Kerrylea for Larry’s famous tour of the caves. Larry is a local and is a lover and expert about the cliffs and the caves. He gives the tour on occasion to planning committee members and city staff, and what he has to say is very poignant and pointed. 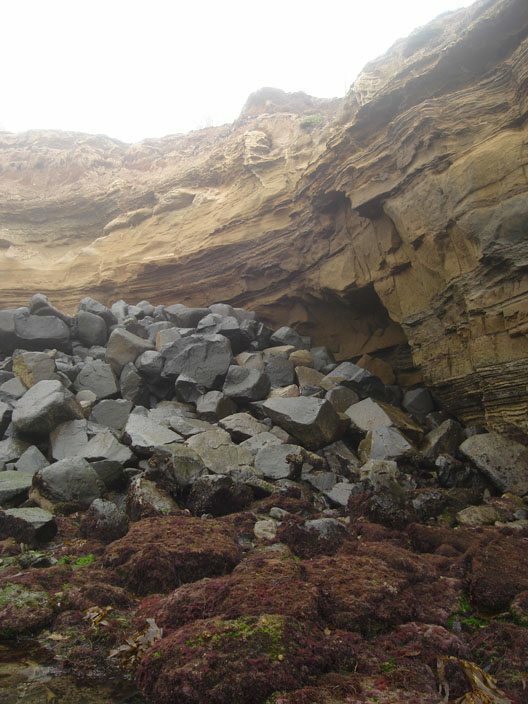 Over the years, the City of San Diego and the Army Corps of Engineers have been destroying the caves and the cliffs by dropping “foreign” boulders over the sides in efforts to shore the cliffs up against the erosive tides of time. By doing so, the natural eco-system of the cliffs is chopped up, making it more difficult for all the native species to thrive along the entire length of the cliffs. 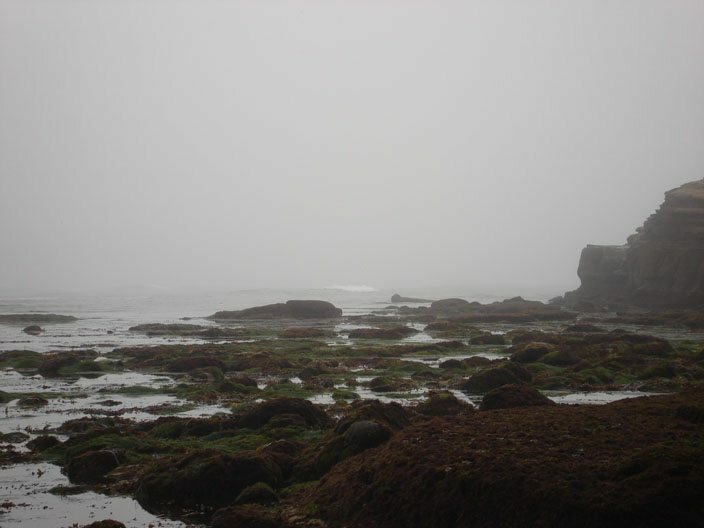 We met Larry and Kerrylea atop the cliffs in the moist foggy darkness of 5:10 in the morning – on our nation’s birthday. We arrived that early as that was the lowest tide in weeks. We had flashlights, some food, and clothing and footwear that was okay to get wet. We started down the cliffs in single file, over slippery boulders that seemed out of place and down onto the beach level. 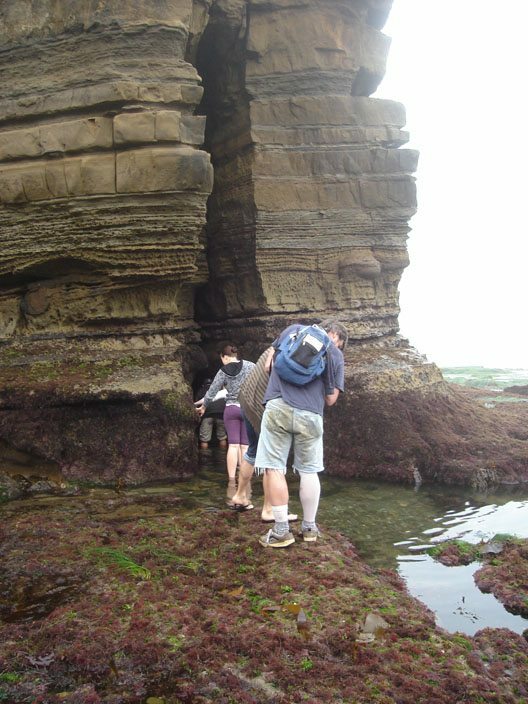 As we carefully found our footing around the sea creatures and through the rocks and water, we entered the first set of caves – filled with sand – with only raccoon paw prints on the sand before us. Larry gave us a continuous narrative about the rocks dropped by the City and Army Corps mostly in 1970. They were “foreign” rocks – boulders really – many of them probably from Catalina Island. They are granite boulders, solid, tight – impervious to water – nothing can grow on them – nothing does grow on them. 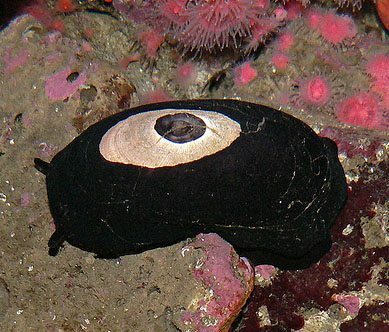 We could plainly see as the light brightened the huge disparity in what was growing on “local” rocks and boulders and what was growing on the outsiders. Nothing. No animal or plant was able to hang on and survive on the granite chunks brought in by humans. 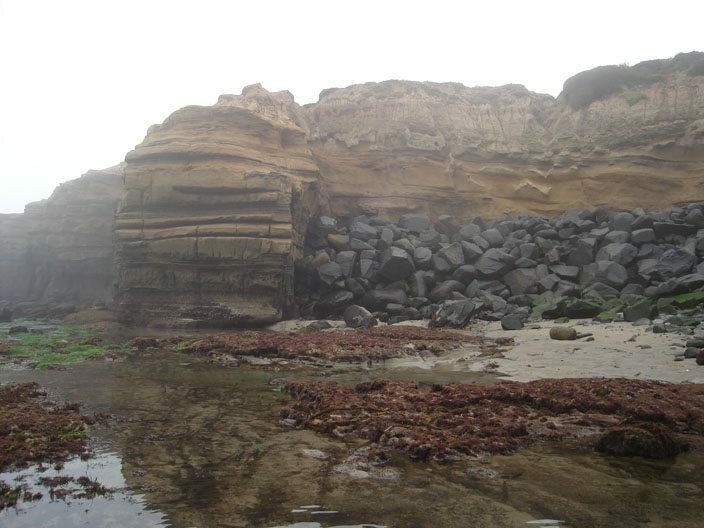 We could see the drastic cuts in the shoreline eco-system, as the boulders blocked one section off from another all along the cliffs. Moving on in patriotic wonder, we entered one long stretch of hollow, crouching down slightly as we felt our way through the grotto. Larry pointed out the different tide pools inside the cave – calling one a “Japanese Bath” as it was large enough for a couple of people. The stretch continued and we came out on a different side, having traversed an entire point of land. We emerged in an area of rock, cliff and water that humans rarely see. The road and civilization are right above us, but down here is a paradise that is guarded by the tides. 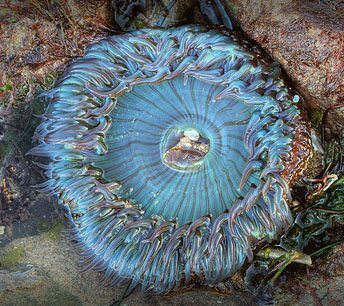 We carefully crept and sloshed past sea anemones, crabs, fish and barnacles – a few of us saw a small octopus – and at times up to our waist in the calm ocean. We understood that many of the caves that we passed through are normally full of water. 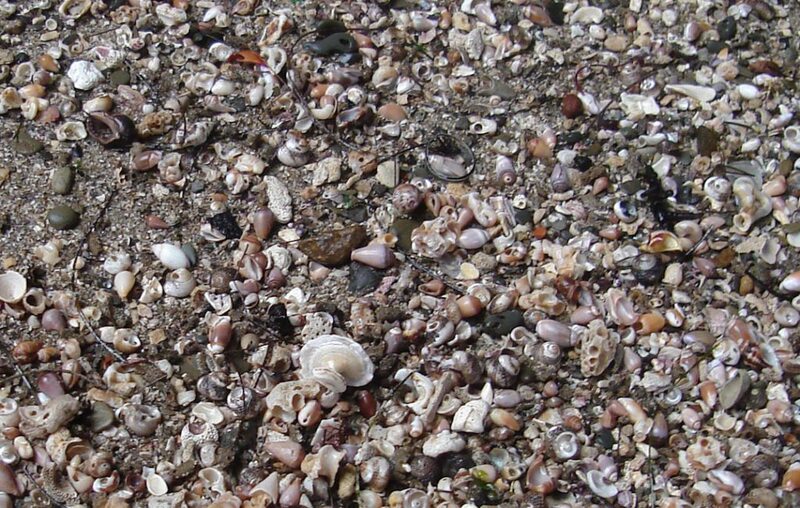 Finally, our last cave was a huge cavern – large enough for boulders, a large swath of sand and a million small shells. We munched on some dry food and pondered the trek that had brought us to this hidden, mysterious cliff world. The tour changes you, as you now appreciate more fully the shore life and the hidden grottoes that lay just beyond your area of vision as you cruise the boulevard of the cliffs looking for waves and surf and freedom. We’re so blessed to live here, these pictures are awesome!!! not to hard to figure out where they are ,…. Beautiful, thanks so much for sharing this. Hi Alissa – thanks for dropping by. It’s always a pleasure. Are you still writing these days? good to hear someone finally saying something about the granite boulders that are a scar on our cliffs. I lost hope they would ever be removed but would love to see them and all other poorly executed attempts to shore up the bluffs removed. For instance the entire foot of orchard ave which is completely covered in riprap and disintegrating concrete. The only life that thrives there is the rats who live in the rocks. Disgusting and sad. Newer Article: Who Started the First OB Marshmallow Fight?